First things first. What is the architectural style of home? You want to select a wreath or swag that enhances your home’s personality. 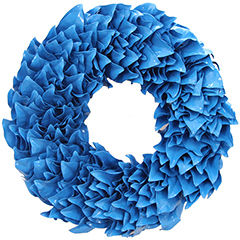 For example, if you have a modern home you might want to consider our Dazzling Blue Lacquer Wreath. If you have a Classic Home choose our Southern Style Magnolia Collection to complete the look of your outdoor décor. 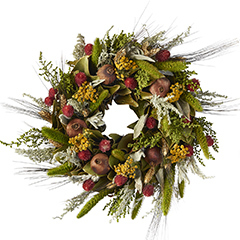 For a Rustic Country Home our Gardener’s Gathering Wreath works best for that on-trend farmhouse feeling. 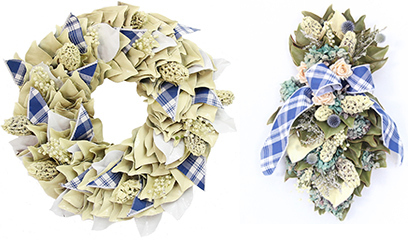 And if you have a beach front home you will find our Nantucket Dreams Wreath and Swag a perfect fit. Next, consider the color of your front door. For a dark door choose a wreath or swag that is light colored and if you have a light door you want to go in the opposite direction, as you look for a strong vibrant colored wreath that will draw attention. The size of the wreath is also important. 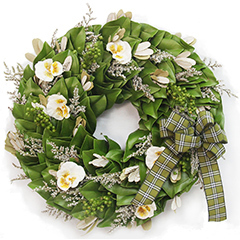 The 18–23 inch diameter wreaths are the best choice for the average front door. To protect the wreath from the elements, it is best to hang it on a door that has an overhang or sheltered area over the door. This will increase the longevity of the wreath, as it is not battling against inclement weather or the drying effects of too much sun exposure. When hanging your wreath, hang it slightly above the middle portion of the door or a quarter of a way down from the top in the center. This will ensure you do not obstruct the door handle. Many of us don’t want to hammer a nail into the front door to hang a wreath. Thankfully, today there is a good selection of devices to help you hang your wreath or swag without damaging the door. There are magnets for metal doors available that make it all too easy, as well as, large metal hooks that hang over the top of the door which work well in almost every situation. There are also suction cups for glass doors. I have found Command™ Hook by 3M works well and does not mar the paint. They are easy to install, hold heavy weight, and can be removed easily. Most people may not think of this, but a nice touch is to have a wreath hanging on the inside of the front door. As your guests leave, they’ll notice the extra touch this accent piece provides in bringing life to your interior hallway or foyer. As a side note, consider sending a wreath or a swag during the spring and summer months as a gift. We often send wreaths to friends and family during the holiday season but seldom realize what a great gifting choice this is throughout the rest of the year. Surprise your mom this Mother’s Day and adorn her door with a luxurious hand-crafted wreath from our vast collection. She will love this unique gift!